KFNB No. 46 (StEG 2704/1898), the last engine of this type built in the ‘heavier’ version. Later 66.12 and subsequently 314.311, it was withdrawn in April 1966 and then for some time served as a stationary boiler. Source: www.en.wikipedia.org. The sole surviving 314.303 (ex KkStB 66.03, StEG 2695/1898), location and date unknown. Photo by Igor Matiovsky (source: www.parniloko.wz.cz, used by permission). Side drawing of ČSD class 314.3; source: EZ vol. 1. Between 1898 and 1908 StEG built 37 class X switchers with 0-3-0 axle arrangement for the Kaiser-Ferdinands-Nordbahn (KFNB). Originally numbered 35 through 71, they were delivered in three batches. The first one numbered twelve engines, built in 1898. They featured smoke tubes 3250 mm in length, 1.6 sq.m grate and maximum axle load of 14.2 tonnes. Second batch comprised four engines delivered in 1899 and six in 1901. In order to reduce weight and axle load, smoke tubes were shortened to 2915 mm and grate was reduced in size to 1.4 sq.m, maximum axle load being 13 tonnes. Water capacity was reduced by 0.4 cu.m and overall length by 500 mm. 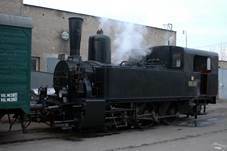 Third batch differed from the second one in minor details and consisted of six engines built in 1906, four in 1907 and five in 1908, which gives the total of 37 examples. In 1909, following incorporation of the KFNB into state railways KkStB, they were classed 66 and given consecutive service numbers. After WWI class 66 engines were divided between Czechoslovakia (24) and Poland (13). Classed 314.3 by ČSD, they remained in use until 1960s, the last one in service being 314.303 (former 66.03, StEG 2695/1898), withdrawn in October 1968 and retained for preservation. With PKP they were classed TKh17, but only twelve were given new service number after designation system had been introduced in mid-1920s. The fate of the thirteenth one, 66.27 (StEG 3309/1906) is not known, apart from the fact that it was written off before 1927. All Polish engines belonged to the ‘lighter’ variant. They served in south-eastern Poland; eight were withdrawn until 1937 and one (TKh17-2) sold to industry. In 1939 three remaining engines were impressed into DRG and numbered 89 8101 through 8103. The Soviets took over four withdrawn TKh17s, of which three later fell into German hands and became 89 8104 through 8106. Five engines were returned after the war, but one (former TKh17-11, then 89 8103) was erroneously included into post-war class TKh100 and numbered TKh100-34. On the other hand, post-war TKh17-5 and TKh17-6 were ex-industrial locomotives of different design – pretty nice mess for such a small class. Pre-war TKh17-12, then with NKPS and later 89 8104, was returned by DR in December 1955 and immediately scrapped without being assigned new service number. Few details of this class service with PKP after 1945 are known, but last survived until late 1950s. No Polish TKh17 has been preserved. The sole surviving engine of this type, ČSD 314.303, was initially plinthed in Valašské Meziříčí, Czech Republic, and later restored to the working order. *) All data refer to the later ‘lighter’ variant. 1) Second and third batch, respectively.